190+ items have no date assigned (mostly CDs), in large part because the Discogs community has decided that Release Date means “date this particular physical manifestation of the music was released”. Many CDs are reissues of older music, and the date they were made is often not easy to figure out. That definition of Release Date also means the chart doesn’t show when my music came from with 100% accuracy. For example, Television’s Marquee Moon was released in 1977, but my CD copy is from 1989 and my 180-gram vinyl copy is from 2012. 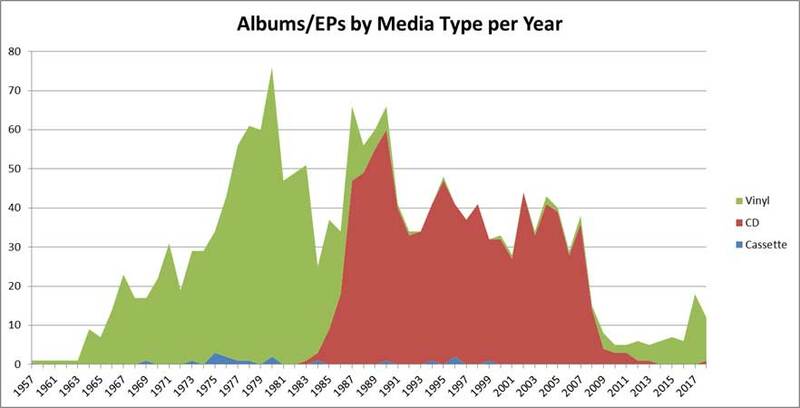 So the chart is skewed towards the current day, but not so much as to make it totally meaningless. The Release Date often has little to do with when I actually bought the item. Still, it’s fairly obvious when CDs became popular, when I started getting a lot of my music in digital format, and when I started paying more attention to my collection of physical media again.